Working at home has lots of upsides, but one major ergonomic downside: Home furniture is designed for leisure, not work. Dining tables are too high, coffee tables are too low, and lap desks are too small and too unstable. If you spend a lot of time working on a laptop, poor working conditions such as these are an open invitation to repetitive motion strain and other maladies. Set up Coalesse’s Free Stand in front of just about any chair, and you’ll have a work-friendly environment that will keep you productive and healthy. And when the factory whistle blows at the end of the day, you can fold the Free Stand flat and slide it under your sofa or easy chair to rid yourself of the irksome visual reminder that you still have to work for a living. The Free Stand is exceedingly well made, with a stand fabricated from extruded aluminum painted with a durable powder coat finish. A pair of 22-inch-long feet lend it stability, with an 18-inch-wide opening to accommodate your feet. You can also orient the base sideways to your lap, because the work surface spins 360 degrees. 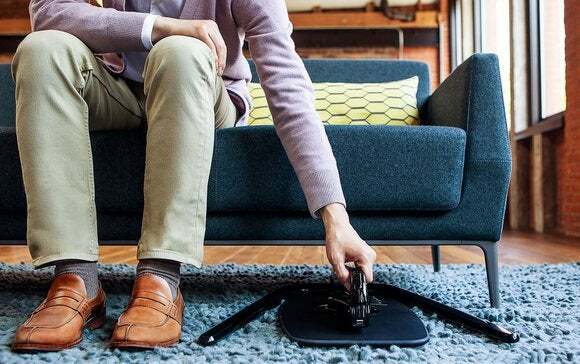 It can be lowered to 20 inches or raised as high as 27 inches, so you should be able to find the ideal height whether you’re sitting on a sofa or in a bean bag. It’s too short to function as a standing workstation, though. Despite its ability to collapse to just 5 inches flat, the Free Stand is a sturdy work surface that should last for years to come. The work surface itself measures just over 19 inches wide by 11 inches deep. That was roomy enough to accommodate my 14-inch laptop, but I had to slide the computer to the left a wee bit to make room for a mouse. 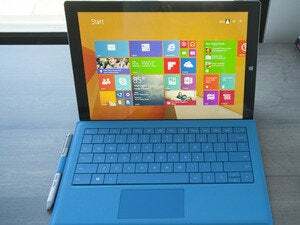 The surface is made from rigid ABS plastic and is covered in a non-slip, soft-touch paint. According to Coalesse, you can wipe away spills using typical household cleaning products, such as Windex or Formula 409, but bleach-based products and hand sanitizers should be avoided as they can discolor or even damage the finish. The Free Stand boasts robust hinges and superb fit and finish. 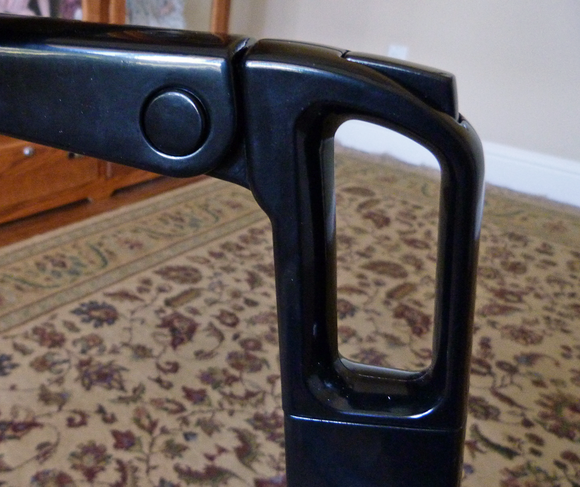 The Free Stand has one handle and three control mechanisms. To fold it flat, lower the work surface by pushing a button at the top of its pillar. Pull a lever underneath the work surface to drop it to a right angle to the pillar (it will lock in that position). Push a second button at the bottom of the pillar to fold the stand flat. The whole assemblage will now be about 5.5 inches high. Repeat the same three steps in reverse to set it up again. The smooth surface on the bottom of the Free Stand’s feet is better than wheels. It glides over hard-surfaced floors as easily as it does carpet. 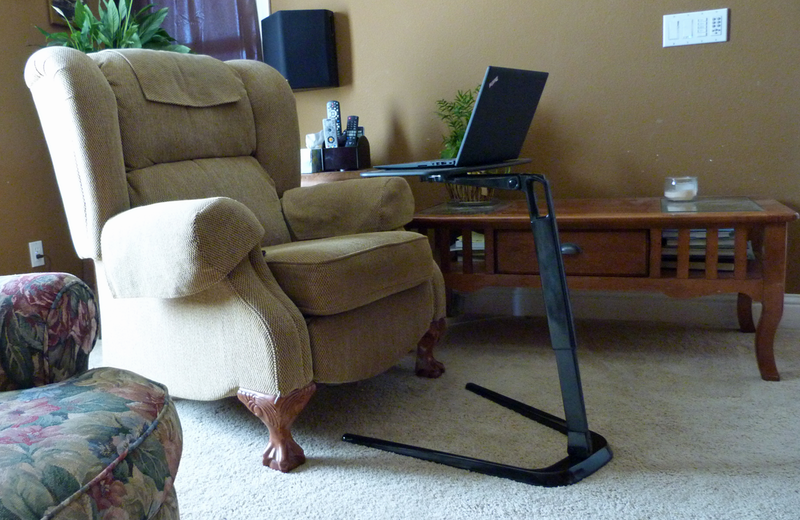 When collapsed, the Free Stand measures just five inches high. The Free Stand weighs 11 pounds, and the handle makes it easy to carry from one room to another. I had no problem carrying it home on the subway, but that’s not an exercise I’d want to do frequently. It’s clearly not designed to be a road companion. I like everything about the Free Stand except its $399 price tag. You could probably find laptop stand at Ikea for a fraction of that price. But it probably wouldn’t fold up or be as well-made. The Free Stand is built to last, it can be stashed anywhere, and it’s a joy to use. I like it a lot. The Free Stand is undeniably expensive, but this well-built mobile work surface helps you be comfortably productive in any casual environment.